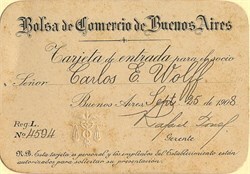 Historic Membership Card from the Buenos Aires Stock Exchange issued in 1908. This item has the signature of the Stock Exchange's Gerente and is over 101 years old. Minor toning. The Buenos Aires Stock Exchange (BCBA; Spanish: Bolsa de Comercio de Buenos Aires) is the organisation responsible for the operation of Argentina's primary stock exchange. Founded in 1854, is the successor of the Banco Mercantil, created in 1822 by Bernardino Rivadavia.